For many Americans, life has been darker, bleaker, more difficult since Donald Trump was elected president. The clouds rolled in on November 8, and they have yet to part. Did we slip into an alternative universe, they wonder, where everything is just a little bit... wrong? Not so at the Conservative Political Action Conference (CPAC), which I attended Friday, arriving just as President Trump finished speaking. Half an hour south from Washington, DC, attendees gathered at the resplendent Gaylord Convention Center at National Harbor, a too-polished development of family-friendly restaurants and retail, with the kind of barren soullessness that marks places designed solely to get people to spend money (there’s a new MGM casino right there, too). CPAC attendees were smiling, wandering happily from event to event, knowing their libturd-smashing agenda is ascendant and the president is once again an old white man. The weather was unseasonably beautiful, sure, but even inside the halls of the convention center, it was springtime for some of the most truly batshit strains of conservatism. Outside the main ballroom, where a parade of conservative politicians, heroes, has-beens, and nobodies spoke, a string of right-wing media companies set up shop along the concourse: Breitbart, RedAlert, the Washington Examiner. And then, another media company: Facebook. Facebook, of course, sponsored CPAC with a $120,000 donation, half cash and half in-kind. The company isn’t new to political events—it’s sponsored CPAC in the past, threw an inauguration party, and participated in both the Republican and Democratic National Conventions. Notably, Facebook was missing from a list of sponsors displayed prominently on the main concourse; perhaps $120,000 isn’t enough to make the cut. Facebook occupied two areas on the conference floor. The first was a Live studio, where conservative media outlets like the Daily Caller and the Washington Examiner hosted Facebook Live videos with grotesques like Senator Ted Cruz. The second spot was a general swag area and “help desk,” where a jovial woman thrust a Facebook tote bag into my hands. Offerings included little GOP elephant and Facebook Live stickers (“great for your laptop,” she told me), a Facebook card wallet for your phone, and Facebook-branded stress balls—because everything is terrible haha!! Facebook’s presence at CPAC wasn’t limited to this booth. Wednesday’s Community Activism sessions included a panel hosted by Facebook titled “Facebook for Politics & Government: Tips, Tools, & Best Practices,” which promised to “help you better reach and connect with voters on Facebook.”A session on Friday afternoon was aimed at news outlets attending the convention, “News on Facebook: Best Practices from Publishers and Journalists (News Partnerships Training).” I attended that session; it was a dry run-through of tips and advice on using Facebook for news coverage, including Facebook Live and polls, much more reminiscent of journalism conferences I’ve attended than the fascist frightfest in the main hall. 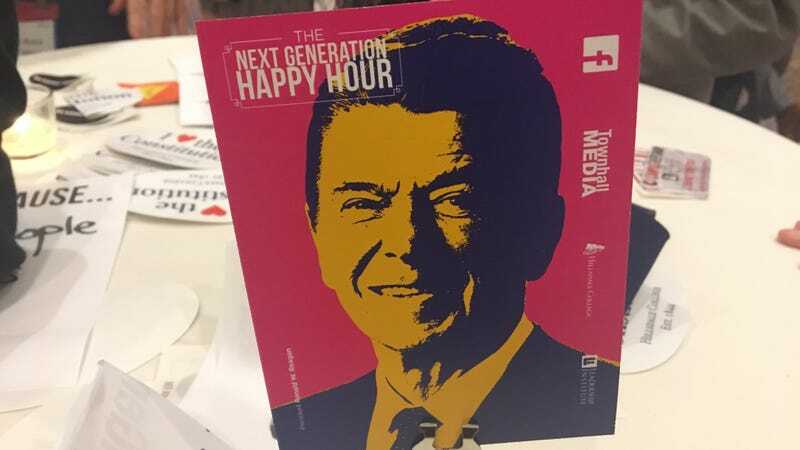 Facebook’s big event, though, happened at 4pm that day: the Next Generation Happy Hour, sponsored by Facebook, Townhall Media, the Leadership Institute, and Hillsdale College. This isn’t the first time Facebook has hosted a soiree with conservative media: for the inauguration, it hosted a party with the Daily Caller, which featured fancy cocktails garnished with Facebook-branded lemons. The Leadership Institute provides training for young conservative activists, targeting college kids especially; smiling young people handed out flyers for Leadership Institute events at the bottom of the escalators. Hillsdale College is a small, conservative university, which prides itself on not receiving federal funding and deploys Sean Hannity to advertise its Constitution 101 courses. Like the rest of the conference, the Facebook-sponsored party was filled mostly with men in suits and (fewer) women in bright dresses with black blazers, with a couple of notable exceptions. Sadly, the party was not open bar. Water was $6, like at a goddamn ballgame. The party had several interactive features: Hillsdale College provided a giant Declaration of Independence for attendees to sign with feather quills. Townhall, meanwhile, had a station where guests were encouraged to write why they’re conservative on a sign and take a photo in front of a Townhall-branded backdrop. That’s Brian Lenney, a columnist at Townhall, having a good time with a cold beer. Points for using two different-colored pens. Facebook’s main contribution to the party was a photo booth—it was provided by MVS Studio but sponsored by Facebook, according to the affable pair of women who ran it. Despite looking like a tent made of tinsel, it was popular because it allowed attendees to take 360-degree photos with their chums, which were displayed on a screen next to it. Most of the pictures seemed to catch subjects unflatteringly mid-drink. Half the attendees seemed to be college Republicans, mostly male; most of the rest were members of the conservative media. Purple media badges identified attendees from publications ranging from the Washington Examiner and the Daily Caller to something called RepubGirlProbs. I spotted Fox News host and Townhall editor Katie Pavlich taking selfies with Guy Benson, a Fox contributor whose website describes him as “The Millennial Conservative.” Jim Geraghty, of the decidedly not-millennial National Review, was there as well. Another man, a libertarian college Republican from Northeastern University, who voted for Gary Johnson, told me he thinks Trump is “the most ridiculous human being on earth.” At this moment, his companion mocked him for calling Trump ridiculous while voting for Gary Johnson. It was a little tense. Facebook representatives at the party, who seemed to spend most of their time talking to each other rather than any of the conservative media, referred my questions to staff at their Live booth. They, in turn, referred me to the Facebook press email, but did tell me that the partnership with Townhall Media was limited to this event and wasn’t an ongoing relationship. By 5pm, my legs were tired and my spirit worn. Out of the corner of my eye, I spotted a brownie on the floor, squashed into the carpet. And I knew it was time to go home.